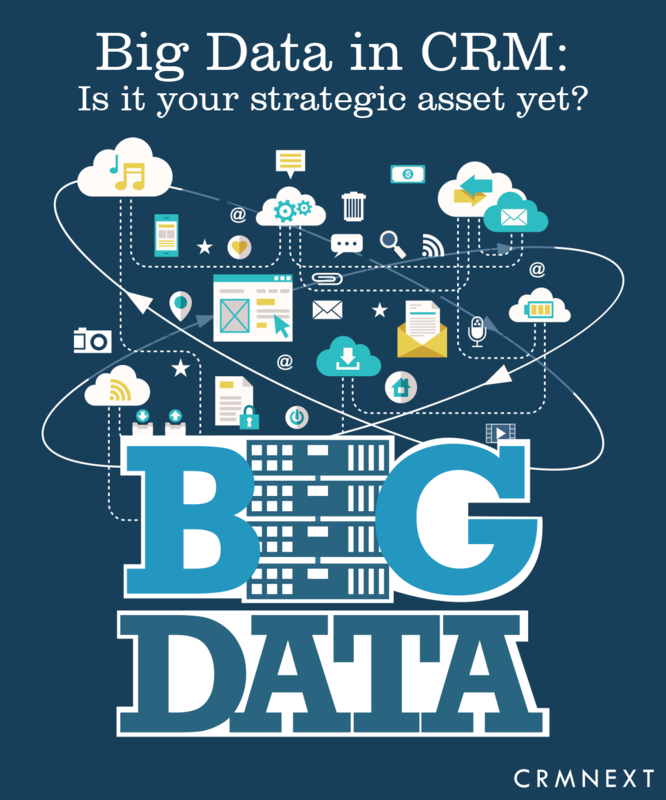 The Best CRM Blog: Big Data in CRM: Is It Your Strategic Asset Yet? Big Data in CRM: Is It Your Strategic Asset Yet? Big data is becoming the world leader in creating business growth strategies. Want to make your business custom-tailored for customers? Or wish to be the front runner in personal interaction with each customer? Turn to Big Data. However, it will remain just a dumb data dump unless you change your approach. Today, companies are realizing that clients know exactly what they want and have specific needs. The only way to stay competitive is to 'hear' these specific needs and make products meeting them. People have become busier and have grown accustomed to instant gratification. They want products that can serve this kind of lifestyle. Tapping into the thoughts of people in social media, streaming data and clicks is the next best thing any company can do. Here's why you should consider big data as your most powerful asset. Big data will help you in understanding customers better than themselves. Customer shopping behavior and interaction history across touch points are the data sources for analysis. Actually, 'improved' analysis is an understatement. The insights derived are far more actionable than was previously possible. No more making business decisions based on your just manager's gut. Reports and analytic collaboration offered by cloud CRM will mince your raw big data into understandable chunks of refined intelligence. Big data in CRM also reduces fraud for data and report manipulation. The trend points are directly picked up in your cloud CRM platform and minimal manual intervention. You get the holistic picture as it is on the ground. Using CRM simply for call logging and maintaining records smacks of a bygone era. Today Digital CRM, fueled by big data, helps businesses predict what the future will look like, often better than Nostradamus. This is done with the help of Trinity Cross Seller Modeler with auto intelligence, Catalyst Performance modeler with campaign planner AND helper, etc. These modelers are pivotal in driving business sales, cross-sell numbers and campaign performance by predicting what future trends will look like. However, behind every future, there is a past. Unless you use your CRM solutions to actively capture AND analyze multiple data from different sources (with the help of Mashup anywhere), you may have to look for (not so reliable) soothsayers. The ultimate competition for your business is not your competitors, but yourself. And to know how you are at the moment, you need big data. Response times, First Time Resolution rates, customer satisfaction indexes etc. are some of the business matrices that point you in the right direction. Realize that what you are looking for is dynamic and not available in your campus. Unless you are a very large MNC having very deep pockets, credit for upgrades is often hard to come by. Even then, due to the current chaotic business environment, behemoth brands have to think twice before implementing any drastic change. Big data eases their concerns. With its help, companies are better equipped to improve on specific areas that customers point out and not changing systems blindly. Harnessing big data in CRM is better and more effective because it does not just serve employees in top managerial positions but also people in sales and marketing as well as production who will implement the feedback. Use it strategically to stake your claim as the game changer in your industry.